Big companies think about everything. That is the case of Nero, that apart from offering its users a wide range of products focused on digital entertainment (with multimedia capability) and information backup, they offer other practical tools for the detection and solution of problems related with their software. Among these utilities, one that is really worth paying attention to is Nero Get Support Files. It is a tool designed to recollect information about all the Nero applications installed, by accessing the Windows Registry data. Thus, with this information the support technicians will be able to solve possible incompatibilities and errors that occur when using any of their products. If you need to send this kind of information to the Nero support technicians, all you have to do is download the application and extract it in a folder of your hard drive. After this, launch the decompressed EXE file. Then an MS-DOS window will open, and it will start the data recollection process. 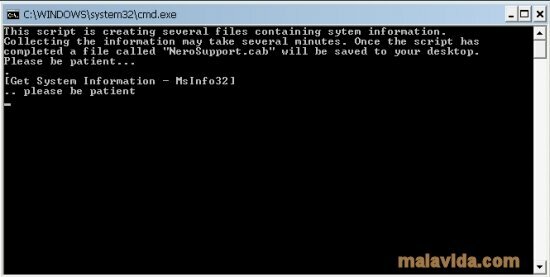 Once the execution has finished, a file called NeroSupport.cab will be created on the desktop, that you will have to send to the support technicians if necessary.